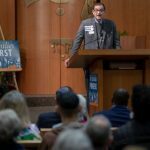 When the social action group Faith in Indiana decided to reach out this session to state legislators on issues most important to those who are marginalized, health care easily landed among the top four. Every Tuesday for the past month, a small cadre from the statewide group, a local affiliate of the California-based Faith in Action, has gathered at the statehouse to share their perspective on an issue that impacts those in their congregations. The group has talked to legislators about a variety of topics, from payday lending to childhood imprisonment to treatment rather than incarceration for those who are mentally ill. Although the group’s primary initiative was to pressure lawmakers and the governor to halt the implementation of Medicaid work requirements, the discussion took place against a broader national discussion of repealing the Affordable Care Act. Monday, President Donald Trump announced in a series of tweets that Republicans will announce sometime after the 2020 elections a replacement for the controversial health care law passed under former President Barack Obama. He promised that the new plan would be far less expensive and “much more usable” than Obamacare. Nicole MacLaughlin, a member of Faith in Indiana, said that her own experience with health care six years ago spurred her to become an activist, to help protect others who might need insurance to save their lives. At the age of 42, the mother of two was diagnosed with breast cancer. She spent the next year and a half in treatment, worried that her illness might require her to stop working, which could jeopardize her insurance. The ACA, however, would have protected her, had that happened. While the national debate over health care could strip people of coverage in the long term, a more imminent threat may be on the horizon for some. Indiana is in the process of rolling out Medicaid work requirements for people, which some of the speakers at Tuesday’s event said could result in lack of coverage for thousands of Medicaid beneficiaries in Indiana. In 2007 Elizabeth Higgs lost her aunt Patty to breast cancer. She was diagnosed at stage one and lost coverage. She was not able to find new insurance until her cancer had progressed to stage four and she died soon after, said Higgs, a member of Hoosier Action. Implementing work requirements for those on Medicaid, asking them to document their work compliance, could place an undue burden on the ill, Higgs said. “If you miss a date, you’re out of the system and what happens to treatment,” she said, adding that the requirements put “added stress” on those who are ill. Such requirements may also come under legal attack. Last week, a federal judge blocked Kentucky and Arkansas from work requirements, a decision that could eventually have implications for Indiana. State officials have said, however, that the way work requirements are being implemented here differs significantly from how other states are doing it. But Faith in Indiana community organizer Sister Tracey Horan said that her primary focus is not on the constitutionality of the measure. “For us it’s a moral concern,” she said.